This one basketball league has produced hundreds of basketball stars right in our backyard. Warning League, a summer recreational basketball league founded in 1975, has turned hundreds of local Milwaukeeans into basketball stars since its inception. Notable alumni include NBA champion Mike Wilks, former Milwaukee Bucks coach Terry Potter, former Wisconsin player Larry Hisle Jr., and Wisconsin’s 1991 “Mister Basketball” Calvin Rayford. On April 6, a new documentary about the league and its history will premier at the Oriental Theater. Founder Michael McGee Sr. started Warning League as an effort to keep less fortunate kids off the streets during the school-free days of summer and in turn, set them on paths for college careers. Today, Warning exists for the same purposes. The league helps players learn to compete–a needed skill when looking to score a spot at the pro level. When Warning League began, teams formed according to street blocks. With tournament-style games, teams competed in parks around the city with dozens of adoring fans watching through chain-link fences. Players were provided shoes and color-coded shirts to differentiate teams. The league showcased the best of the best Milwaukee natives. Playing in the league was more “flashy” than normal high school basketball, recalls former player Craig Harden. But underneath the show, real dedication and determination drove Harden and the rest of his teammates to greatness. He remembers the numerous calls the league received, and still receives to this day, from Division I schools and high-level basketball scouts. 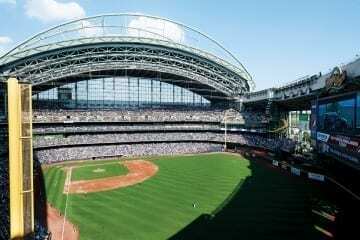 Today, around 90 percent of the league’s former players are still in the Milwaukee area. Many of these men still practice their loyalty to the brotherhood by making time to mentor, teach and encourage new league members. Calvin Rayford, one of these men, coaches for Warning using knowledge he acquired during his own years on the courts. After playing for the University of Kansas, strong community ties brought Rayford back to Milwaukee to work with current league members. RELATED The Brewers’ Long Rebuild is Over. Could This Be the Year? Warning League is the city’s oldest basketball league and the third longest running inner-city basketball league in the nation. This success drove Chris Harden and Victor Barnette to tell Warning’s story through a documentary. As former league players themselves, Harden and Barnette admire the balance between basketball and brotherhood Warning encouraged. The film, “Warning: The Basketball Documentary,” gives a history of the league, from the start, to the rise, to its current state, highlighting its underlying purpose along the way. “Warning: A Basketball Documentary” premieres on April 6, 2017 at Landmark Oriental Theater on Farewell at 7:30 p.m. The film premiere is hosted by Running Rebels Community Organization.